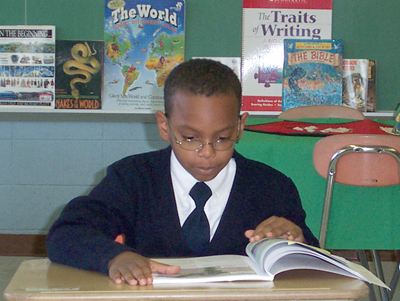 The admission process at Archangel School is about much more than just interviews and forms. It�s about taking the time to really get to know our prospective students and their families. It�s about working carefully to shape a student body that represents a broad range of socioeconomic backgrounds and ethnic cultures. It�s about gaining a sense of each potential student�s ability to excel academically in a rigorous environment, and discovering the special spark that will enable him or her to shine here. The administration at Archangel School prides itself on giving families the attention, responsiveness, and care they deserve. To that end, we�ve brought together online materials that will help you complete the admission process as efficiently as possible. Most important, we�ve given you the chance to hear our students� voices; there�s no better introduction to our school. We hope these resources prove helpful, and look forward to sharing more information about Archangel School admission process with you via e-mail, on the phone, or in person. Archangel School is committed to making a solid, spiritual, and challenging academic experience available to any student. The tuition has been kept to a minimum to support this mission. As a result the school relies on contributions of time and treasure from benefactors, alumni, and parents to keep the boat afloat. We view Archangel School as more of family than an institution. We welcome and need parents to support and participate in school activities. Archangel School recognizes that economic times are difficult, especially so for families. If you have more than one child attending you will receive a tuition discount for all additional siblings.